“I was facing a double mastectomy and chemotherapy to treat stage 2 breast cancer. How I looked at the time wasn’t a priority,” says Cormier, who was diagnosed in 2016 at age 27. But the more she heard about the program, which teaches skin care, makeup and wig tips to people with cancer, the more intrigued she became. Finally, she decided to see what the fuss was about. Cormier attended a two-hour workshop at her cancer center alongside other women with various types and stages of cancer. “I was so wrong about the program,” admits Cormier. Cormier went home with a goody bag full of donated cosmetic products and a renewed sense of optimism. Look Good Feel Better is one of several nonprofit programs that taps into the power of tending to personal appearance to bolster the spirits of people with cancer. 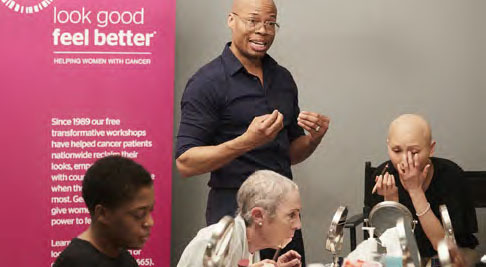 Currently in its 28th year, Look Good Feel Better is a collaborative effort among the Personal Care Products Council, the American Cancer Society and the Professional Beauty Association. Licensed beauty professionals, including hair stylists, makeup artists, aestheticians and nail technicians, volunteer their time to teach participants about skin and nail care, as well as how to use cosmetics, wigs, turbans and accessories. The nonprofit organization hosts workshops in more than 2,000 hospitals, cancer centers and community centers nationwide, as well as in 25 countries. There are also online tutorials, programs for teens, information for men and a smartphone app that lets people upload photos to see what they’d look like wearing different types of makeup and wig styles. For many people, appearance and self-esteem are deeply intertwined. 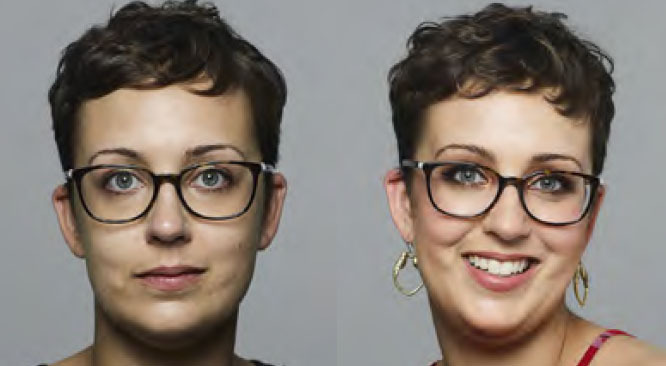 A Harris Interactive survey found that almost all women — regardless of whether they had cancer — said their looks affect how they feel about themselves. In the same survey, up to a third of women with cancer said that changes to their appearance brought on by cancer treatments had a negative effect on their relationships with spouses, children and friends. Some confessed to staying home because they didn’t want to be seen in public. A 2007 analysis of body image in cancer survivors found that many men, too, experience dissatisfaction with their body image after treatment for cancer, and that poor body image seemed to negatively affect mental health in these patients. Losing one’s hair, including eyelashes and eyebrows, is only one unfortunate side effect of cancer treatments. The harsh drugs also do a number on skin. Kiernan, a beauty editor, wrote her book after undergoing treatment for breast cancer. “Yes, I was concerned about my health,” she says. “But I also wanted to look like my normal self, especially because I was working in the beauty industry.” One woman Kiernan interviewed for her book said that maintaining a normal appearance was important for the sake of her young children. Regardless of the reason, Kiernan asserts, beauty treatments are an adjunct therapy to cancer treatments. “When you look good, you do feel better,” she says. Celebrity makeup artist Renata Helfman, of Los Angeles, appreciates the importance of putting on a brave, attractive face while waging this very personal war. Inspired by this memory and a desire to help other people with cancer look and feel their best, Helfman founded Lipstick Angels in 2012. Licensed, professional makeup artists and aestheticians provide spa-like services a couple of times a week to patients getting infusion treatments at select cancer centers in California and New York. Caregivers also can receive the spa services. “We’ve found that patients like being able to do something nice for the person who is there looking after them,” says Helfman. Participants also receive complimentary product samples. “We only use all-natural, chemical-free beauty products to reduce patients’ exposure to potentially dangerous chemicals and ensure that skin is cared for responsibly,” says Helfman. Lipstick Angel representatives are used to hearing a polite “no, thank you” when they approach a patient about beauty services for the first time. This reaction doesn’t surprise Alison Snow, Ph.D., a social worker and assistant director of cancer support services at Mount Sinai Beth Israel Downtown Cancer Centers in New York. Doing something enjoyable and creative for yourself can provide the mental boost you need to fight hard another day, agrees Linda O. Williams, of Brooklyn, New York. Williams was undergoing treatment for a neuroendocrine tumor and liver cancer at Mount Sinai Beth Israel Cancer Center when she signed up for a workshop sponsored by Fashion Fights Cancer. Based in New York City, the nonprofit offers people with cancer an opportunity to express their creative sides through fashion- and design-oriented activities. Williams took part in a fashion photo shoot where she received photography tips from world-renowned fashion photographer, Giovanni Zaccagnini, and a fashion model. Both volunteered their time. Eventually, Williams and other participants found themselves on the other end of the lens, serving as models in their own professional photo shoot. “We did individual photos and group shots. Some women were bald; some bared their mastectomy scars,” recalls Williams. The sessions were anything but bleak. “There was music and singing and dancing. We tried on hats, jewelry and accessories. We laughed a lot. It was one of the most uplifting moments of my life,” says Williams, who formed lasting relationships with the women in her session. She also stayed in touch with Zaccagnini, who often emails the group to see how they’re doing. The bonds that Williams forged through Fashion Fights Cancer positively affected her attitude. “Cancer patients belong to a special community of people,” she says. Williams has since participated in other Fashion Fights Cancer workshops, including one where she designed and made a handbag with the guidance of accessories designer Katherine Kwei. “It was so nice to have something creative to focus on besides the magnitude of my cancer diagnosis,” says Williams. Look Good Feel Better does not offer a group program specifically for men, having found little interest in face-to-face workshops for these patients. But the organization does offer a brochure and a website with a video, at lookgoodfeelbetter.org/programs/men/, that give instructions to men about how to manage skin changes, hair loss, stress, nutrition and exercise. For the patients more interested in participating in programs, there are many benefits to living in the fashion hub of New York City, as Williams does. She has been able to select gorgeous, high-priced designer clothes for free through a program called Fabulous and Fighting, a nonprofit that collaborates with fashion houses to donate new apparel to people with cancer. “Every time I slip on the blouse or jacket I chose, I feel beautiful,” says Williams. “This isn’t frivolous stuff. People with cancer don’t have time for nonsense.